What's Nice: listening to The Mingus Big Band performing jazz in the Concert Hall, knitting the finishing rows of the Linen Mode Jacket while reading James Lee Burke . I came to this author via the First Tuesday Night Book Club on the ABC and am fascinated by his descriptions of the life and land of Southwest Louisiana; places like New Iberia, the Atachafalaya River, antebellum mansions and the Gulf coast. ..the light was never harsh, never superheated or smelling of tar roads and dust as it was in other neighborhoods. 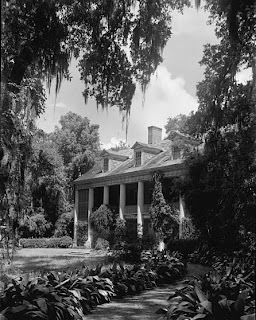 Instead it filtered through Spanish moss and bamboo and philodendron that dripped with beads of moisture as big as marbles, so that even in the midst of summer the morning came to those who lived here with a blue softness that daily told them the earth was a grand place, its design vouchsafed in heaven and not to be questioned. 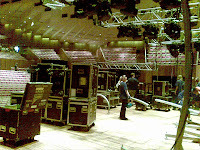 At the end of the Mingus Big Band the Big Bump Out; derigging all the box truss, the tri truss, the moving lights, cables, shackles, slings and bolts; packing it all up to leave a clear stage for the SSO performance the next morning; taking it all down to an already packed Central Passage and squeezing road cases and lead trolleys into tiny spaces; driving the long road home after midnight, feeling desperately in need of a shower and another cup of coffee to stay awake. Apparently the name "Teche" is "a French word meaning "snake" based on a story about a large snake told by the Chitimacha Indians to the settlers in the area." It refers to a tributary of the Mississippi.